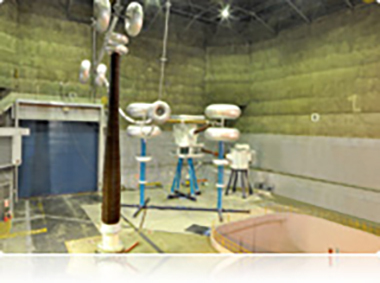 UHV AC Test Hall | Research & Development | NGK INSULATORS, LTD.
UHV AC Test Hall Dimensions of hall:40m x 40m x 30m h.
AC 1500kV High Voltage Source Transformers:750kV, 1375kVA, 2 units in cascade connection, corona free up to 1000kV. DC 500kV High Voltage Source Type:Delon-Greinacher circuit by using silicone rectifiers. Radio noise meters:NEMA type meter, CISPR type meter. Partial discharge measuring instruments:MPD600 type.